Later the following day, she learns that the accounts at Laguna are no longer accessible, including her own. At home pondering what she can do to help Laguna, two men visit claiming to be National Security Agents and attempt to kill her. She flees for her life, armed only with her laptop. Early in her flight, she discovers that other hackers along the West Coast have either committed suicide, been murdered, or mysteriously vanished in recent days. We then follow Judy as she tries to tie together her plight, and that of other hackers, with the attack she witnessed on Laguna Savings. While this is going on, we are introduced to the man behind the Laguna heist, teen uber-hacker Calvin Nikonchik. He has been hired by Robert Ingersoll, an NSA agent, under the pretense of a national security project. Ingersoll wants to show the government just how unsafe the net is, and wishes to prove it by simultaneously hacking into thousands of banks overnight. Laguna was only a test run for the real operation, which is to occur a week later. Ingersoll hopes that if the operation proves successful, the government will all but remove itself from the information network that now encompasses the entire globe. Calvin has no idea, however, that Ingersoll is retired, and that he is backed by Bradley Barrington, a technophobe financing the illicit operation in the hopes of shattering public trust in the Internet and returning the world to the good old pre-Internet days. During Judy’s journey, we meet a large number of computer hackers who display the stereotypical signs of social ineptness. Fortunately, however, Gresh and Weinberg show us through Judy and Calvin that the inability of some hackers to function normally with other humans comes both from ostracism as children due to computer-nerd syndrome, as well as from painful childhood experiences that turned them in on themselves. They trust only the hard, yet reassuringly unyielding, rules that define the computer world. Judy loves her life, but she begins to see that she harbors a long-buried need for closer human contact. By the end of the book, we see her learning how to interact better in real life by drawing on the strength she discovered during the crisis. to realize his sexual fantasies—Gresh and Weinberg show us what drives him and dictates his actions. His intelligence makes it difficult for him to interact with others and his domineering, jock-like brother has compounded his social ineptness by making him feel inferior. Unfortunately, this attention to character development is not applied to all the characters in the novel. Robert Ingersoll is an uninteresting thriller antagonist. The scope of his attempt to steal billions of dollars from banks throughout the world is impressive, but his inability to see beyond his immediate concerns renders him almost laughable. He loves his country, yet he seems unable to grasp the true nature of the chaos that would befall America should his plan prove successful further demonstrates his shortsightedness. Barrington is equally unimpressive as an incredibly rich technophobe; technology has passed him by so fast that he has decided he must somehow end its use. It’s almost as if any complexity of thought would cause brain-lock and make it impossible for either villain to do evil. Yet, once you consider Gresh’s expertise in the field — she is in fact a computer security specialist — the story in Termination really gives you pause for concern. Unlike those in a Crichton or Clancy thriller, the events in this novel feel as if they really will occur. Gresh’s experience in the industry allows the authors to make us painfully aware of just how unsafe the Internet is when it comes to protecting our personal records. No amount of data encryption software and no firewalls will make a network truly safe from a determined hacker. Readers gain a sense of just how much information about them someone can glean if he/she is determined enough to find it. We realize how easy it is for someone to make complete shambles out of our lives from information that can be found in databases worldwide, both private and public. The descriptions of the hackers at work are impressive. They both resemble and differ from the vision offered up by William Gibson in Neuromancer. Gibson’s classic still resonates throughout sf, especially when it comes to cyber-visions of the future. In Termination Node, hackers continue to break into heavily guarded, supposedly secure networks, still commit cyber-sabotage, and shady elements help bankroll it all. The longtime vision of cyberpunk and other recent computer-dominated futures remains alive and well. It’s almost impossible to read the novel without thinking of Case jacking into his deck and attacking cyberspace while visualizing it all in his head. However, Gresh and Weinberg have seen another 15 years of computer evolution to base their story upon. Even though Gibson’s vision helped project the direction of computer evolution and the way we as a society view computers, like many other sf visions of the future, it has overstated that future a bit. Despite recent Hollywood-produced cyber-dreams and nightmares such as The Matrixand The Lawnmower Man, we know that the virtual reality world remains far off. 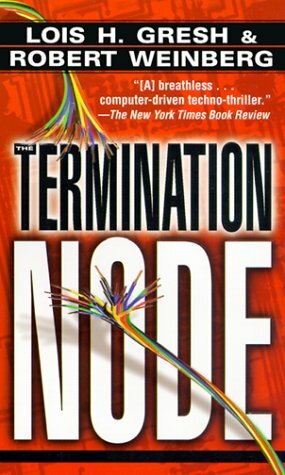 The hackers in Termination Node, much like today’s hackers, are as text-based as the hackers who inhabited the computer world of the mid ’80s. Yet, accuracy does not equate with memorable impressions; the actual nuts and bolts of hacking, performed by Judy and Calvin, lack the poetic imagery Gibson gave to Case’s adventures. Terminal Node shows us the dark possibilities of the information age and gives us reason to pause. Many think of hacking as something that affects only major Web sites, government databases, and large corporate networks. Yet Gresh and Weinberg have written a thriller that personalizes an all-too-real danger which could strike anyone. They deftly execute this near-future nightmare with nonstop action, realistic characters of a type you don’t often find in thrillers, and writing that never distracts us. Despite the obvious similarities, this book is a completely different monster from Neuromancer, and one definitely worth reading. Gresh and Weinberg have written an engaging novel that doesn’t use the poetic imagery often associated with the cyber-world while making the reality more real. This entry was posted in Book Review, Lois H. Gresh, Robert Weinberg. Bookmark the permalink.